The regeneration of Randlay Local Centre saw J-Ross Developments Ltd work closely with Telford and Wrekin Council on this joint venture retail development agreement to ensure its successful delivery. 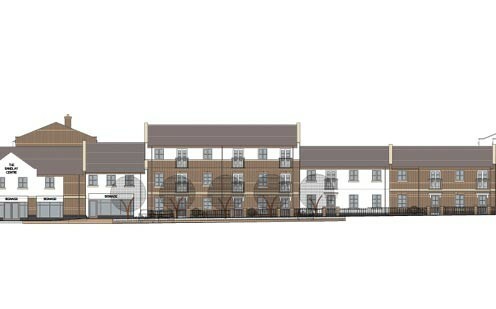 In close proximity to Telford Town Centre the development has provided 47 apartments, eight houses, three retail units and a Community Centre on a site of 0.919 hectares (2.270 acres). J-Ross Developments Ltd initiated the redevelopment of this brownfield site for efficient and sustainable use, contributing towards commercial and residential need, providing a replacement retail centre and community building. A highly detailed pre-planning consolations took place with the Local Planning Authority and community stakeholders groups to agree a specification for the residential, commercial and community facility. The phased redevelopment of the site also involved closing and infilling of redundant pedestrian underpasses and the important development of new pedestrian routes.